Health information exchanges (HIEs) play an important role in the care continuum. They make it easier for providers, facilities, and other healthcare organizations to share patients’ medical information across regions, communities, and systems. Consequently, their goal is to provide a secure, centralized location to share documents and records. In doing so, that will help promote better health outcomes while defraying the costs of information sharing. As a result, all of the multiple organizations, facilities, and providers working within the system, record and workflow standardization present a challenge to HIEs. Each of these audiences most likely has their own methods for recordkeeping, not to mention workflows on how their caregivers provide care. Therefore, when a data request is made, this lack of standardization and workflow integration can lead to inefficient, slow results. Care Directives’ Advance Directive Information Exchange (ADiE) gives HIEs the tools to streamline and standardize documents for easier sharing. 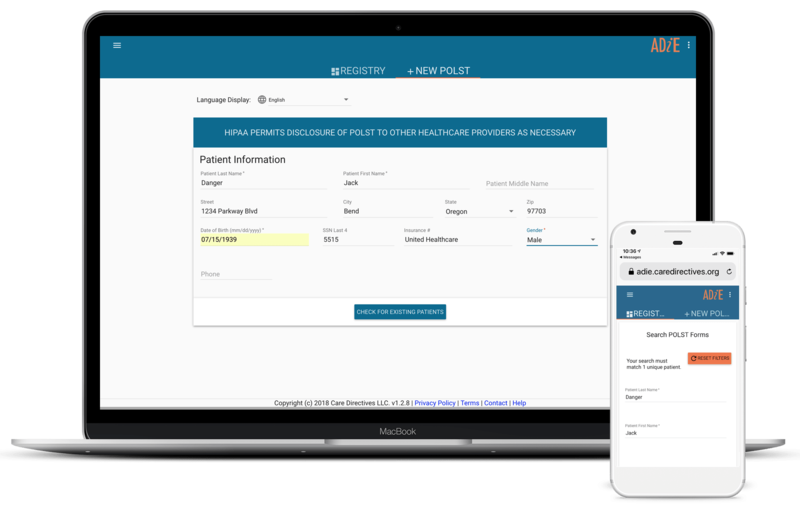 Subsequently, ADiE records advance care planning documents, such as POLST/MOLST forms, Advance Directive, online medical directive, and legal directive records in a secure, centralized repository. It can then serve these records up in real-time and integrate them into an organization’s workflow for greater efficiency. Plus, there’s no scanning, faxing, or copying records, which helps keep down exchange and storage costs.